This is only the second time that I’ve been the principal photographer for a published project, so I was pretty nervous about getting it right. It all went quite smoothly, though, and five garlicky (to varying degrees) shrimp plates later, I had a bunch of images I was quite happy with, including the five that were published in the magazine. 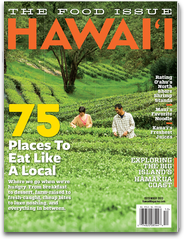 We drove out to the North Shore from town via H-1/Likelike/Kahekili, so these are presented in geographic order going thataway. We set out early, hitting the first truck at about 10:30 a.m. when they first opened. That’s a wee bit early for so much shrimp and garlic, but we were on a mission, having to hit five spots by the end of the day, and trying to avoid the crowds. We pretty much managed to beat them through the first three stops and our last stop was well after the lunch rush. If you’re crowd-adverse, go early or go late, and try to make it on a weekday instead of a weekend. Also, bring cash. The big disappointment here, though, is that the shrimp aren’t served up cooked to order. 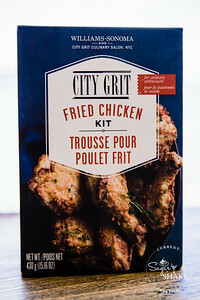 They have a bit of a grainy texture, as if they’ve been sitting in a warmer. On the other hand, there was no wait for our plate. They’re served hot, so they are still quite tasty, but—especially when you’re among the first customers of the day—we felt they ought to be cooked when you order, not before. This was the only truck we visited to not cook to order, although, I’ll admit: If you go during peak lunch, it probably doesn’t matter—I suspect at that point, they’re cranking shrimp out constantly, so it’s virtually made on the spot. 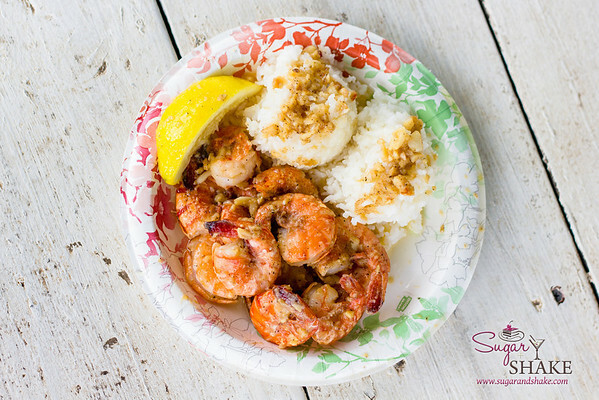 Despite that, this is still the quintessential “Garlic Shrimp Plate,” heavy on the garlic and the butter, no frills, two scoops rice. 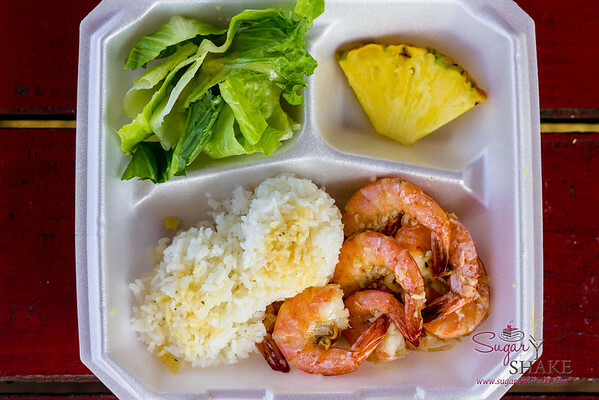 Not far down the road, Romy’s Kahuku Prawns & Shrimp serves up their locally raised crustaceans in a red shack next to their aquaculture ponds. 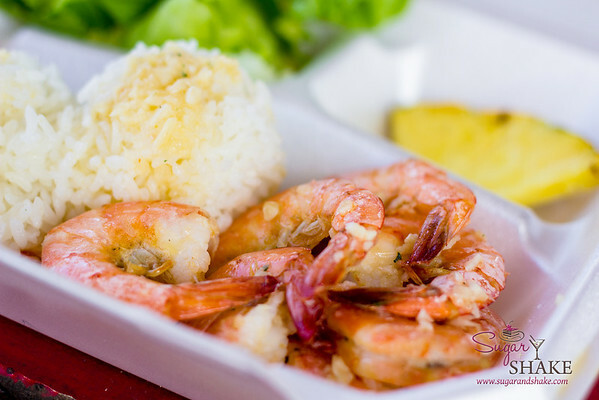 A pickup truck with a couple burly local guys riding in the bed drove up out of the field, pulled up to the back door to deliver a massive tub of fresh shrimp as we licked garlic butter off our fingers. Romy’s was easily one of my two favorites of the day. The garlic butter here has a reddish tint and a subtle “there’s something a little different here” flavor—probably from achiote. The garlic is also on the charred side, which I really like! And also, because they’re using shrimp fresh from their backyard, the little critters are cut a bit differently than at all the other places—there’s a half-bite extra of meat at the head end—you can see in the photos that they’re pointy, not cut flat off as you normally see. 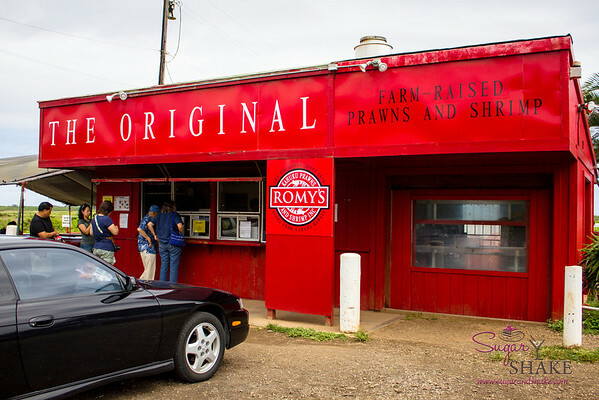 It’s easy to spot Romy’s as you drive down the road—it’s in a bright red building and there’s a big “Romy’s” banner positioned so you can read it as you’re approaching. 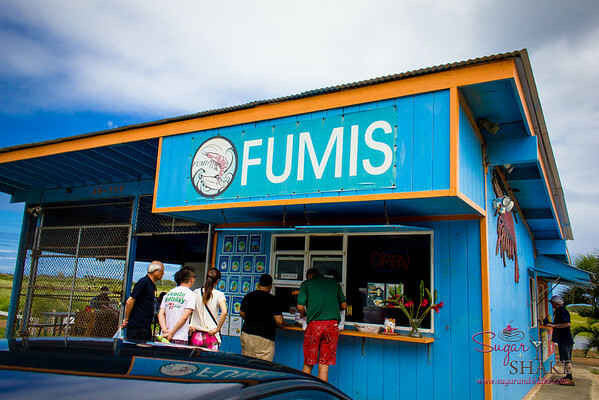 Fumi’s Kahuku Shrimp Truck comes in two versions: Truck and Shack. They serve the same stuff. 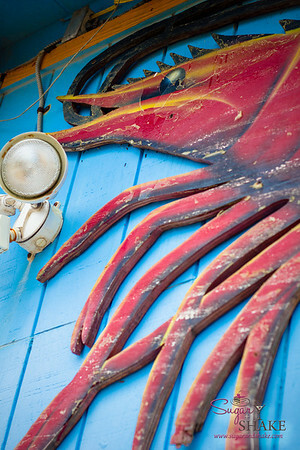 We didn’t know exactly where on the road any of these places were located (yeah, they have addresses, but this is the boonies; no one looks at numbers, you just look for giants signs of shrimp), so when we saw the blue shack and giant letters, “FUMIS,” we pulled over. Turns out there’s a truck (with an enormous shrimp painted on it) a little further on. The shack seems to cater to tour vans, so it may be more crowded here (there is more seating) than at the truck. Not entirely sure of that, but that’s my hunch. 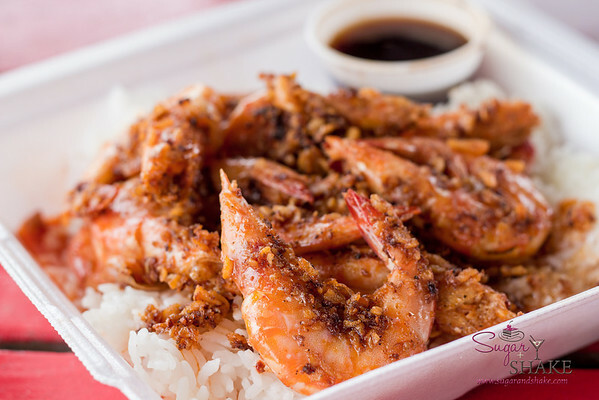 If you aren’t a huge garlic fan and you’re watching your butter intake (why are you even going to a shrimp truck? 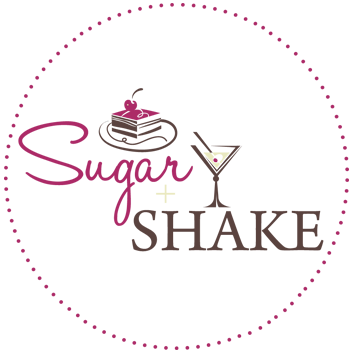 ), then this is your choice. 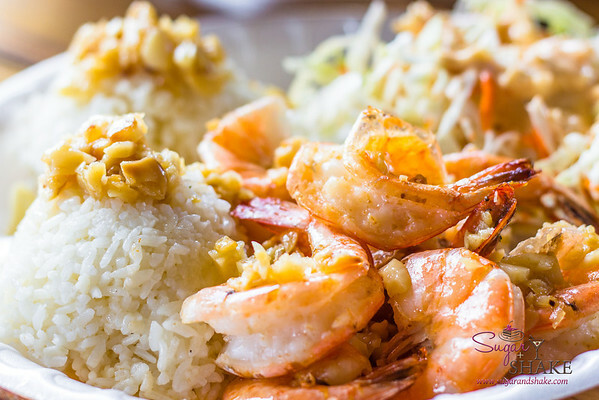 I deemed it suitable for “garlic-butter amateurs.” Although we were trying to watch our starch consumption so as to be able to tackle all five plates, we found ourselves devouring the two-scoops-rice at the first two stops because they were irresistibly drenched in saucy goodness. Not so at Fumi’s. 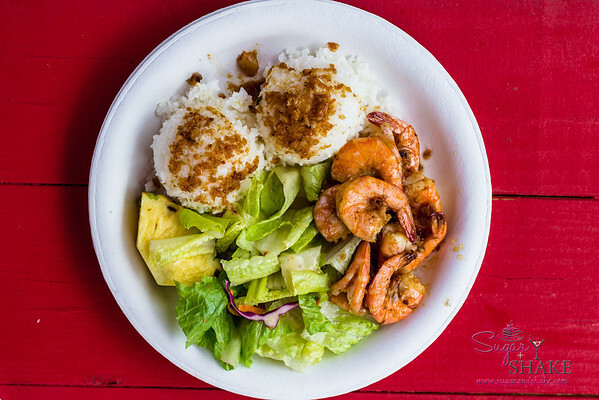 The shrimp here were also the smallest of the day, so if you’re a big eater, you probably want to skip this one, too. 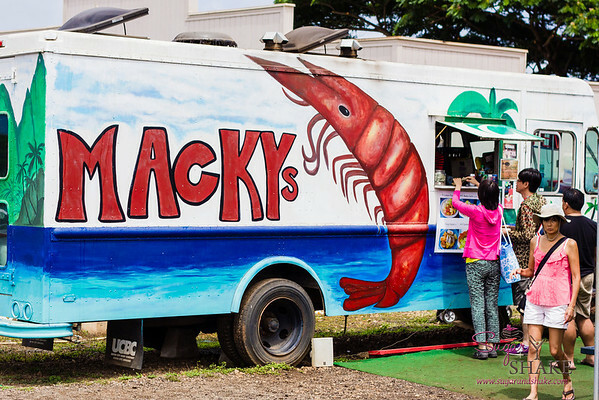 Our fourth stop was Macky’s Sweet Shrimp Truck, which turned out to be my other favorite. In fact, I would even give it the flavor edge over Romy’s. 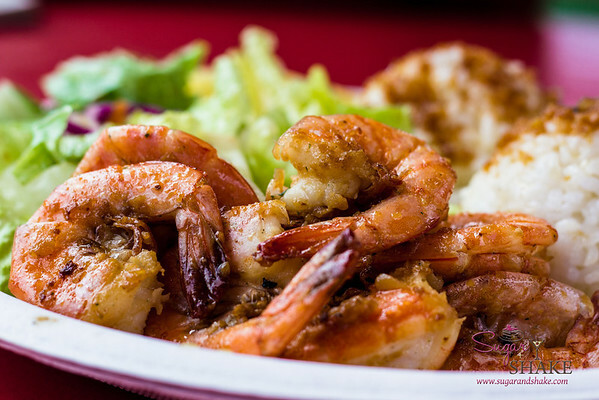 It is not, however, in the traditional garlic-butter-sautéed-shrimp plate mode that the other four hew to. 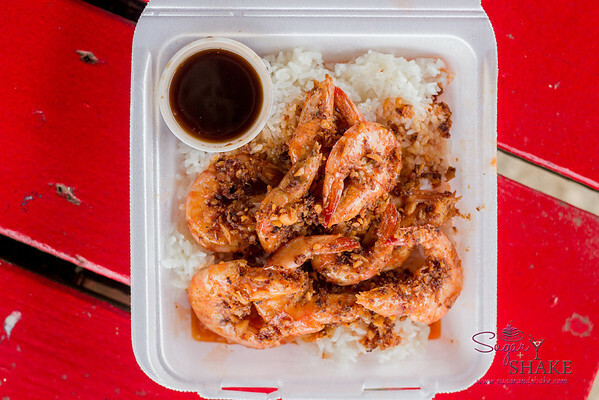 Macky’s shrimp have a Southeast Asian cuisine flavor to them—a little of that fish sauce salty funk, a smattering of charred garlic and no butter taste. 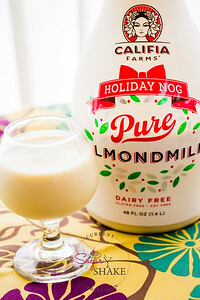 But oh-so-good! Not as intensely garlicky as Giovanni’s or Romy’s and it did come with the same green salad and pineapple wedge that Fumi’s did. (Maybe it’s an Asian thing?) I let the boys have the pineapple this time. No one wanted the salad here either. 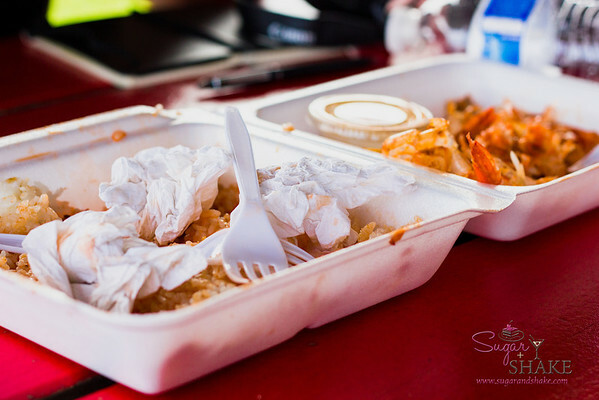 I would be willing to haul all the way back to the North Shore for the sole purpose of shrimp-eating only for two of the plates we had all day: Macky’s and Romy’s. 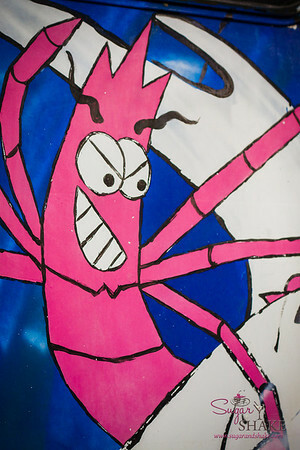 That’s Big Wave’s ninja surfer shrimp (OK, maybe he’s just a surfer, but he looks kind of ninja to me) on the left and Fumi’s gigantic wooden cut-out shrimp on the right. I’d say that for the “garlic amateur” this is a better option than Fumi’s because the shrimp themselves were plumper and tastier and while they didn’t have the in-your-face garlic taste we were looking for, they had a definite garlicky quality and more butter sauce (which you really need to go with the rice). A Thousand Island-drenched pile of shredded iceberg lettuce and carrots made an appearance here, which we all could’ve done without. But you can’t blame these places for wanting to round out their plates a bit; I’m sure there are folks who would complain bitterly if there were no greens at all. 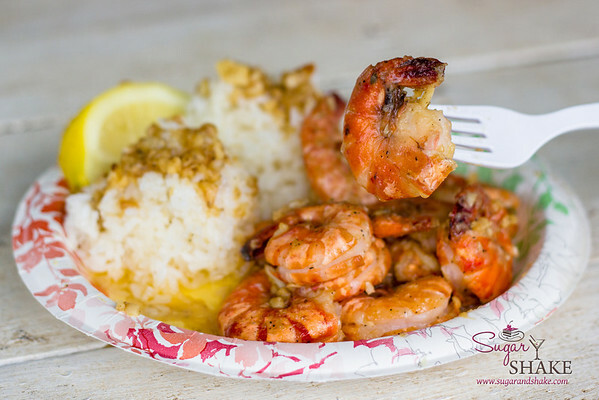 Garlic shrimp plates are messy. 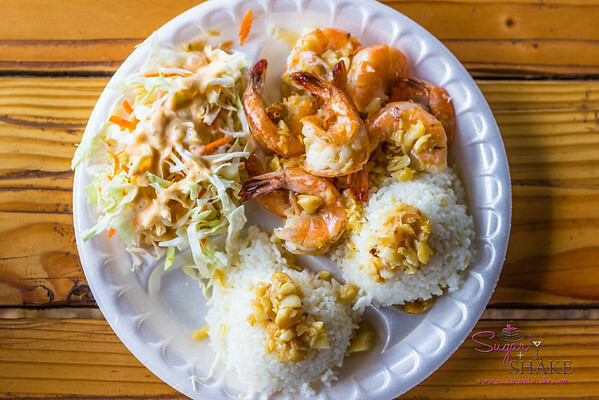 The shrimp are served shell-on at all five of these places and the garlic buttery is greasy and runny. I am freakishly neat, however, and can consume an entire plate and only get two fingers dirty. And use just one napkin. 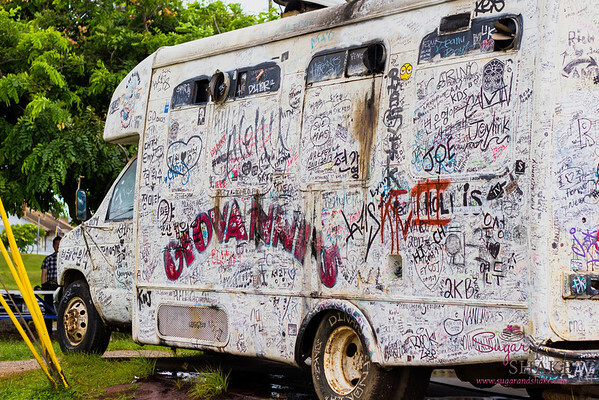 I did, though, bring two purse packs of wet wipes with me so we could cleanse our garlic butter paws, but most of the trucks/shacks actually had sinks and/or bathrooms. We didn’t use them because we didn’t want to wait in the lines, but you may be happy to know they’re there since I know my two-finger-one-napkin technique is probably unattainable for most people. You still might want to bring your own wet wipes, though. After all this shrimp, butter and garlic, we needed a palate cleanser. 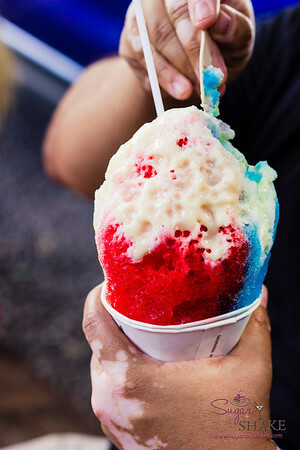 And if you’re on the North Shore, shave ice at Matsumoto’s is practically required. We actually preferred Aoki’s, until they shut down in August of this year, because the lines were shorter and we liked the grind of their ice better. But, alas, they are no more. And Matsumoto’s is still some good stuff and they have a good handle on their operation. They run an efficient shop with a good order taking and number issuing system. Their cones are eeeeeeenormous! We tried to be cool locals and forego the dopey plastic holder, but we were both failures. We might’ve been successful except that we both like ice cream in the bottom of ours (and Shake likes to get a “snow cap” of condensed milk over the top, too) which seems to cause more of a syrup pool. Even a gentle squeeze of the paper cone causes it to runneth over. 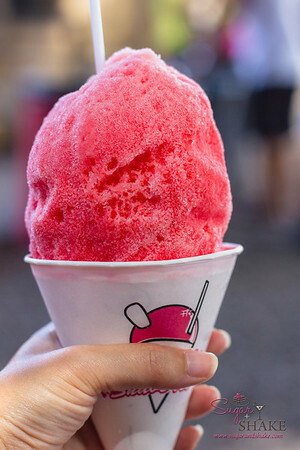 Sweet, cold shave ice really hits the spot after all the oily, salty, garlicky shrimp, so I highly recommend a shave ice pit stop after your shrimp plate. So, at the risk of starting a war, which is your favorite shrimp truck? Beautiful photos and awesome reviews, congrats!! I did this exact same shrimp truck crawl a few years ago with two friends, well except your last stop. We ordered one plate at each and shared, it was so much fun!! Thank you!! Did you blog the crawl? Leave the link! I have to say that customer service would probably have impacted my thoughts, but I confess that I did not go up to any of the windows, so I have no idea what kind of service they gave or how much the plates cost. 🙂 I didn’t totally dislike Giovanni’s — the garlic quotient was awesome!